Hi just want to say your photography is soooo amazing!!!! Few days ago, I discovered your blog and until now I am addicted to read and watch at your webside. The writing is great ( also I haven't read everything till now) but the more I am impressed of your pics. Sooo fantastic. Did you learn it? Or are you just a natural talent? Which camera are you using? I love to read food blogs because I am also addicted to food / cooking... and I have to say your blog is very special. I would be interesting to hear more about why and how you was coming to do this kind of blog ( maybe you wrote about it before???) It would be great if you can write about it or if you like to give me a message. 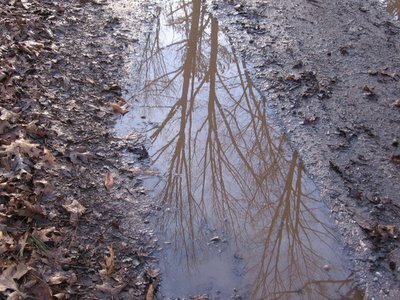 Beauty in the most unlikely places..a puddle if the mud...I love it!! I took an architecture /design class in college and they always told us to look everywhere, from buildings to the pavement for beauty. You seem to have an eye for it too. That is a beautiful picture. What kind of camera do you use? You're very talented! I love checking out your daily photos. loved the latest pictures !! What a great photo. What a wonderful use of a mud puddle. Lovely and unexpected. A great perspective! this is a marvelous image. Thanks so much. Please see above for a link to my camera. I highly recommend it, especially for beginners. 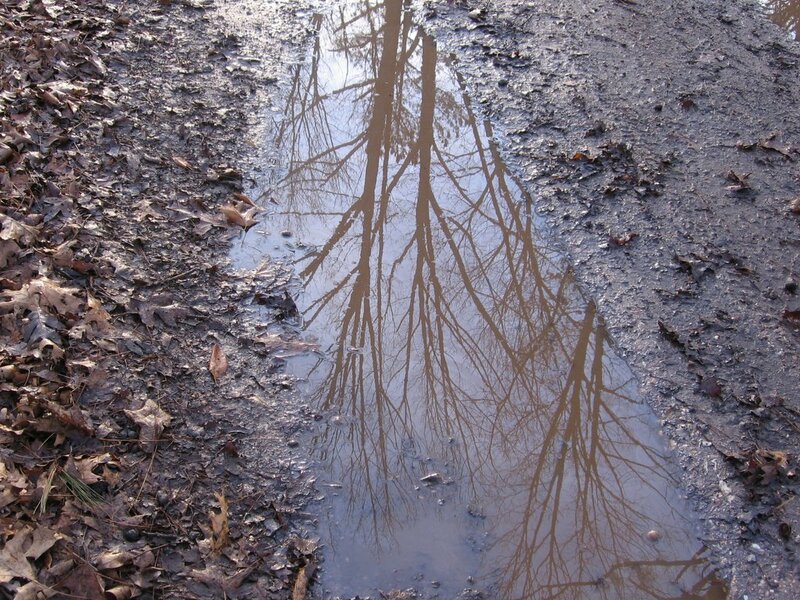 Of course the very best use of a mud puddle is to splash through it wearing rubber boots! hope you you survived the sprawling metropolis and have come back to reflect on calm pools of water instead. Wonderful pics, keep them coming! Your photographs just get better and better. As you may know, on Saturday 2/4/06 Blogger was having some kind of illness and, among other problems, comments left were not posting. Here is a copy of a comment I left yesterday. Apologies for all the confusion. Okay, I'm back as promised to answer your questions. I haven't had any lessons and consider myself a definite amateur. I have always liked taking pictures, but before starting this blog, I had taken maybe a total of 10 rolls of film in my entire life. The fully automatic digital camera is my saving grace. And I'm finally getting used to the idea that you can take more than one or two shots of something because there is no film to waste! 1. I, too, am addicted to food and cooking. And now that I live on a farm, my life basically revolves around food. 2. Food & garden writing, which I was already doing for various magazines and publications. Once I started Farmgirl Fare, I also realized how wonderful it was to connect to other people with interests similar to mine--as well as to be able to share my life on the farm with people who love the idea of country living and are interested in learning more about it, or who simply enjoy farm life vicariously through my blog (all the beauty and fun and none of the work!). Shortly after I moved to rural Missouri from Northern California, I started publishing a newsletter called Writings From Windridge Farm that was full of various lighthearted stories about my introduction to life in the country. It also contained garden tips and tidbits as well as plenty of food talk. Ten issues were published, and nearly every person who read them suggested they be collected into a book. My plan right now is to put excerpts from each issue either right here on Farmgirl Fare, or, most likely, on a separate blog to be linked to from Farmgirl Fare. This will give people who enjoy reading about country living (or who are thinking about making the move from urban to rural) more of an idea of what it's been like for me. Oops! There's the timer which means I need to get back to some bread dough. I hope I was able to answer your questions. Thanks for taking the time to write. I look forward to hearing from you again.